We would love for you to visit! Whether you want to tour America’s First Cathedral, walk through the Pope Saint John Paul II garden, visit our museum, or simply pray in our stunning Basilica, we welcome you. For information on tours, click here. 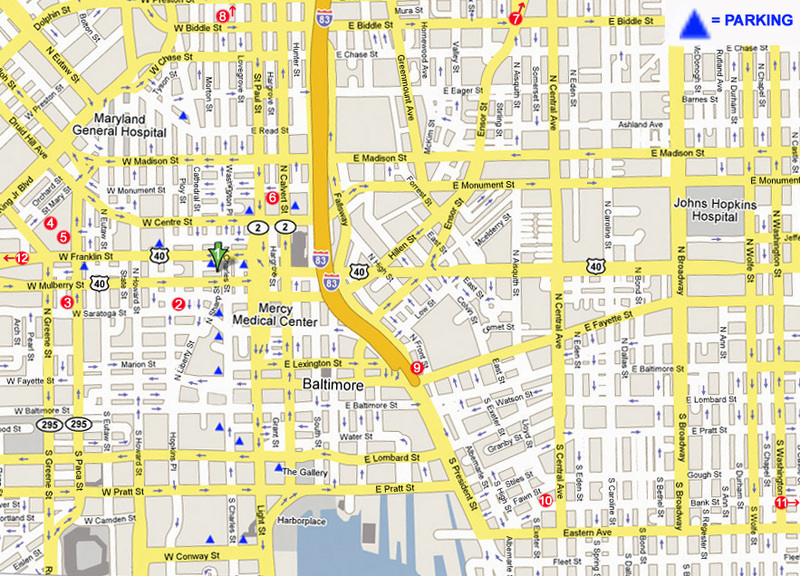 For our location and directions, click here. For everything else, scroll below. 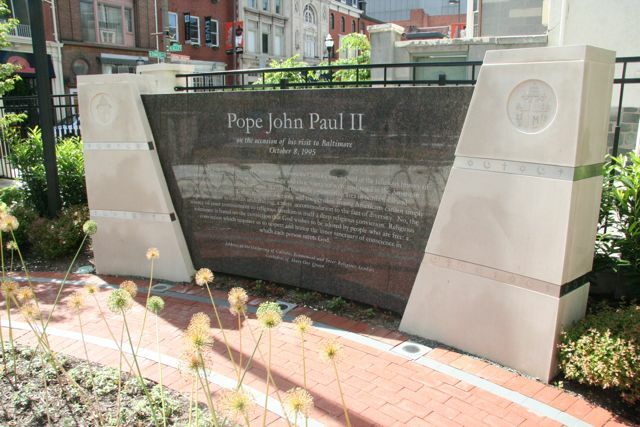 Pope Saint John Paul II and his two visits to the Basilica inspired a commemorative prayer garden adjacent to the Basilica complex, which opened to the public on October 24, 2008. The pontiff, who came to Baltimore in October 1995, was paying the formal visitation of a Pope to one of his Basilicas, but it was not his first trip. 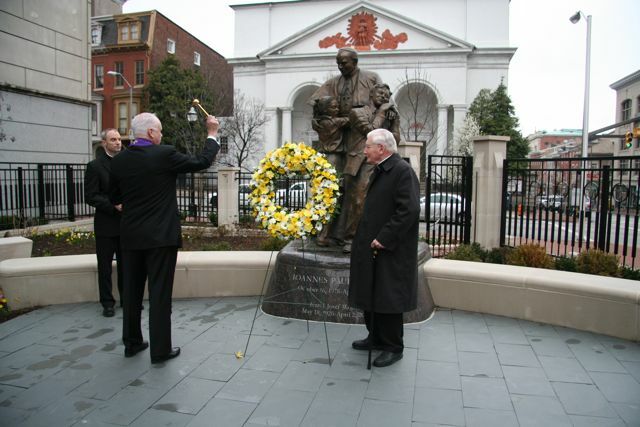 In 1976 he visited the Baltimore Basilica as Cardinal Karol Wojtyla, with seventeen other Polish bishops. 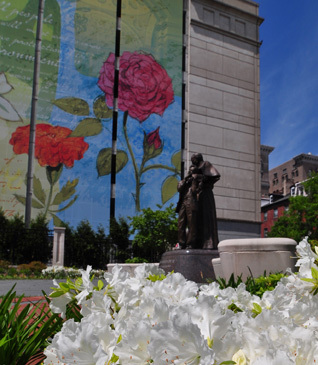 This beautiful space is located at the corner of Franklin and North Charles Streets, adjacent to the Basilica. 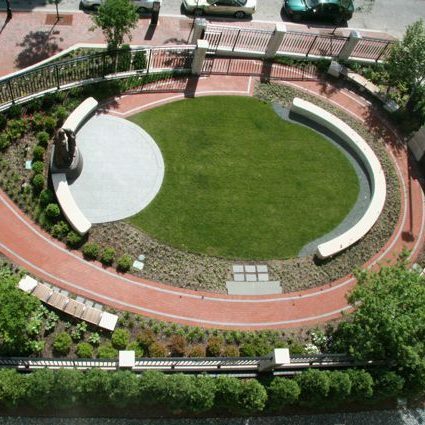 One of a few green spaces in downtown Baltimore, the garden provides pilgrims and visitors with an outdoor spiritual retreat within the city, while paying homage to Pope John Paul II, one of the 20th century’s true visionaries. 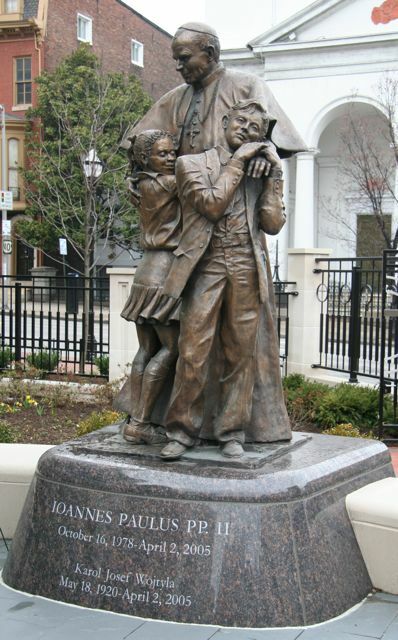 The centerpiece of the garden is a statue of the Holy Father with two children representing the Archdiocesan Catholic Schools (Melissa Brent of Columbia and Justin Farinelli of Pasadena), sculpted by Joseph Sheppard. 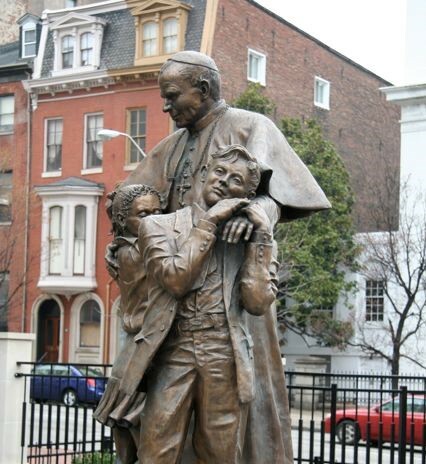 This statue is based on a photograph taken during his 1995 Papal Visit to Baltimore. 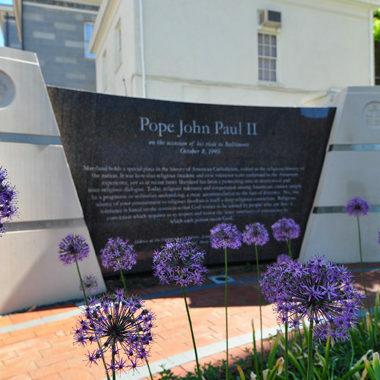 The Pope John Paul II Prayer Garden is open 7 days a week from 9am until 3pm. 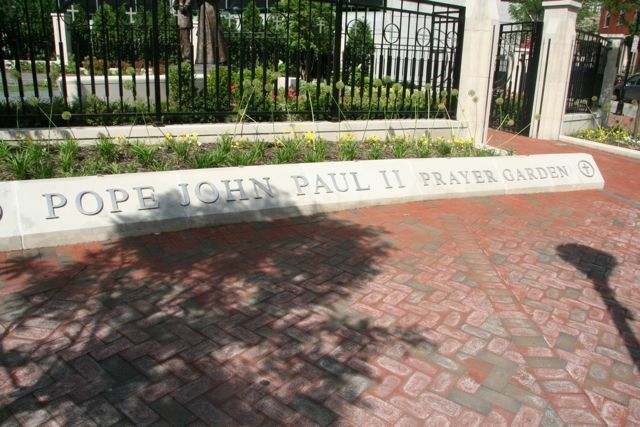 Please note that during inclement weather and on holidays, the Pope John Paul II Prayer Garden is closed to visitors. If you would like to incorporate the Prayer Garden as part of your group tour of the Basilica, simply request to see the Garden when you are scheduling your tour. For more information about tours of the Basilica, please click here. See below to view a photo gallery of the garden. An overhead view reveals the garden’s fish shape, reflecting the image often associated with Jesus throughout the Bible. An oval lawn takes the shape of the “fish’s head” and a brick pathway forms the perimeter of the entire fish shape. 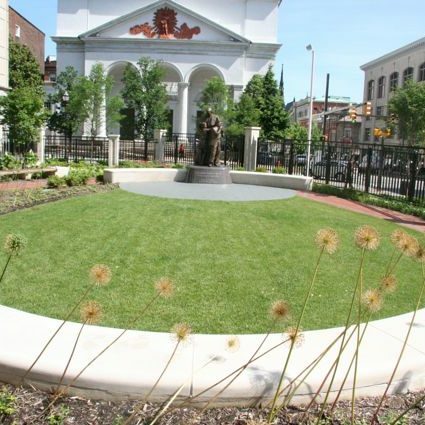 The bricks used in the garden match those used in the streetscape on Charles and Franklin Streets, while the iron fence is a modern interpretation of the one that surrounds the adjacent Basilica. A granite wall, forming the southern border of the garden, is inscribed with a quote from the Pope about religious freedom. The Pope’s words come from his visit to the Cathedral of Mary Our Queen in 1995. Stainless steel bands are also embedded in the wall and bear the symbols of the three monotheistic religions: Christianity, Islam and Judaism. The concrete pillars holding up the inscription wall bear the seal of the Archdiocese and the coat of arms of Pope John Paul II. The mural banner depicts the following flowers traditionally associated with Mary: Rose, symbolizing the Virgin herself (early rosary beads were made from compressed rose petals); Lily of the Valley, also called “Our Lady’s Tears” (it was said to have grown where Mary wept); Marigold, called “Mary’s Gold” by early Christians who placed the flowers around statues of Mary, offering the blossoms in place of coins; and Lily, a symbol of the Annunciation and Mary’s purity (according to tradition, the soft whiteness of the Madonna lily became so only after she picked one–prior to that it had been yellow). Altar vessels used during the Basilica’s earliest days. The Basilica Museum is part of our guided tour. The Basilica is a proud member of the Mt. Vernon Cultural District, which is a collaborative partnership among the cultural institutions in the Mt. 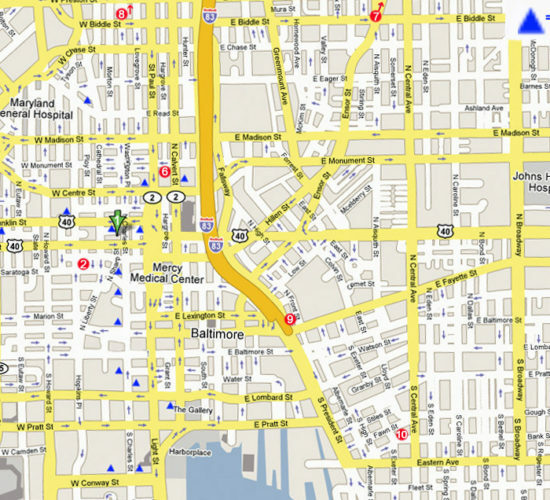 Vernon area of Baltimore. The Mt. 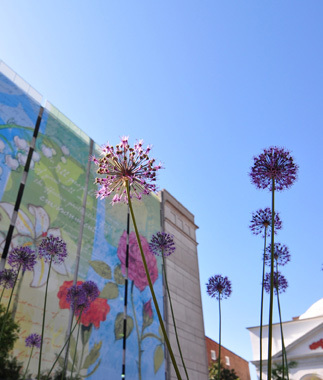 Vernon Cultural District provides unequaled and rich of cultural experience. Since the founding of the Peabody Institute in 1857, Mt. Vernon has enjoyed a continuing association with the arts. Nineteenth century Philanthropist George Peabody’s vision of Baltimore’s citizens attending lectures, listening to music, viewing art, and using a well-stocked research library has been realized. Today, nationally and internationally renowned institutions – museums, theaters, opera and symphony halls, colleges, libraries, shrines – coexist in the Mt. Vernon Cultural District with newer institutions that add to the area’s vibrant mix of culture. The Walters Art Museum is internationally renowned for its collection of art, which was amassed substantially by two men, William and Henry Walters, and eventually bequeathed to the City of Baltimore. The collection presents an overview of world art from pre-dynastic Egypt to 20th-century Europe, and counts among its many treasures Greek sculpture and Roman sarcophagi; medieval ivories and Old Master paintings; Art Deco jewelry and 19th-century European and American masterpieces. Situated directly across the street from the Basilica, the Enoch Pratt Free Library is one of the oldest free public library systems in the United States. In January of 1882, Mr. Enoch Pratt offered a gift to the Mayor and City Council of Baltimore of a Central library, four branch libraries, and an endowment of $833,333.33. “My library,” said Mr. Pratt, “shall be for all, rich and poor without distinction of race or color, who, when properly accredited, can take out the books if they will handle them carefully and return them.” This central library, which opened in 1886, was located on Mulberry Street. The Cathedral Street building opened in 1933. The Pratt’s Mission: To provide equal access to information and services that support, empower, and enrich all who pursue knowledge, education, cultural enrichment, and lifelong learning. The Peabody Institute was America’s first music academy, and founded in 1857 by George Peabody, who is considered by many to be America’s first philanthropist. As part of one of the nation’s leading universities, Johns Hopkins, the Peabody Institute trains musicians and dancers of every level, from small children to seasoned professionals, and dedicated amateurs to winners of international awards. Each year, Peabody stages more than 150 major concerts and performances, ranging from classical to contemporary to jazz, many of them free. As a testament to the vision of Mr. Peabody, the Institute will celebrate its 150th Anniversary in 2007. The George Peabody Library is a remarkable research library housed in an outstanding building that is a showcase of 19th Century architecture. Dating from the founding of the Peabody Institute, over 300,000 volumes are housed, largely from the 18th and 19th centuries. The BSA is a national leader in preparing high school students for careers in the arts. BSA provides qualified students with intensive training in one of four disciplines: the visual arts, music, theatre, or dance. A further mission of the school is to serve as an arts resource to the Baltimore community by offering performances, educational workshops, and extensive after-school training in the arts to Baltimore. Baltimore’s leading professional producing theater company for over forty years, is considered a pioneer in America’s regional theater movement. Smart, bold interpretations of both classic and contemporary plays, combined with exceptional production values, have earned a reputation for both innovation and excellence as well as the following of a loyal audience. Artistry – in service both to artists and the audience – is Centerstage’s top priority. 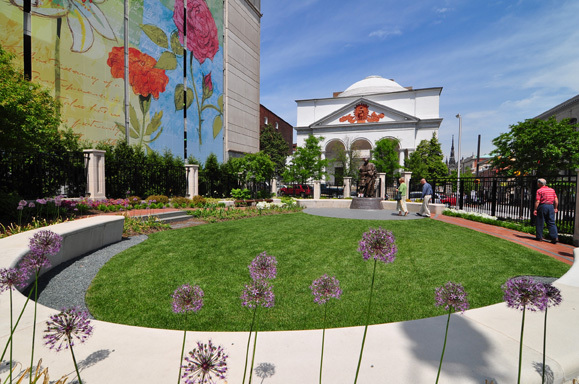 This unique site promotes the unique history and continuing legacy of African-American Art and culture in the City of Baltimore. Through exhibitions, programming, and educational activities, low and moderate-income residents have the opportunity to participate in the arts and culture. A special focus is made on extending the work of the Institute to encourage young people to participate and learn the discipline of the arts. Located on West Mt. Vernon Place, the Mansion is a jewel in the crown of Baltimore’s most distinctive historic homes. A unique example of a building that combines the work of two of America’s most distinguished and influential architects: Stanford White and John Russell Pope, the mansion epitomizes nineteenth century Golden Age elegance and grandeur. The MD Humanities Council is a non-profit educational organization that stimulates and promotes informed dialogue and civic engagement on issues critical to Marylanders. The Council encourages public dialogue that interprets the human experience, promotes cross-cultural understanding, explores human values, strengthens our community, and connects us to the wider world. The public humanities programs, both staff-initiated and grant-supported, help provide a bridge between the academic community and the general public. Eclectic Northern Italian cuisine with Mediterranean flair, located in the heart of Mount Vernon. Call ahead to arrange for pre-fixe menu for large groups. $$$-$$$$, kids ok, large groups OK. Hours: Lunch, Monday – Saturday: 11am-2:30pm. Dinner, Sunday: 5pm-9pm; Monday: 5:30pm-9:30pm; Tuesday – Thursday: 5:30pm-10:30pm; Friday and Saturday: 5:30pm-11:30pm. Rated ‘Excellent’ by Zagat’s, and a perennial ‘Best of Baltimore’, Ban Thai serves delicious Thai cuisine at moderate prices. $-$$, kids ok, can accommodate groups up to 100 persons with a reservation. Hours: Monday – Saturday: 11am-10pm. Mick O’Shea’s is an American-Irish neighborhood pub. We serve traditional Irish fare, like Shepherd’s Pie and corned beef and cabbage; and other favorites, such as juicy burgers and shrimp salad. Hours: Kitchen, Monday – Sunday: 11:30am-12am. Bar, Monday – Sunday: 11:30am-2am. Baltimore’s Premier Pizza Bar offering Eat-in, Carry-Out and Delivery with locations in Federal Hill, Mount Vernon and Canton! Cazbar is a Mediterranean restaurant open daily for lunch, dinner and late night fare. 20% discount for Basilica groups (must provide confirmation letter), $-$$, kids ok, can accommodate 100 with a reservation (pre-fixe menu), reservations required for 16 or more. Hours: Monday – Sunday: 11am-11pm. We are dedicated to offering authentic Spanish cuisine such as paella, fillet of sole with bananas and many other favorites. $$-$$$, kids ok, large groups OK. Hours: Monday – Thursday: 1:30am-2:30pm, 5pm-10pm; Friday: 11:30am-2:30pm, 5pm-11:30pm; Saturday: 5pm-11:30pm; Sunday: 4pm-10pm. Friendly neighborhood tavern and restaurant, boasting fresh seafood, salads, sandwiches and homemade pizzas. $, kids ok, can accommodate moderate-sized groups (40 or less). Hours: Kitchen, Monday – Saturday: 11am-1am; Sunday: 11am-12am. Bar, Monday – Sunday: 11am-2am. American fare including bison burgers, salads, brick-oven pizza. Price range: $$, reservations, kids,groups OK. Hours: Daytime: Monday – Friday: 11 am – 3 pm; Evening: Monday – Thursday: 5:30 pm – 10 pm; Friday and Saturday: 5:30 pm – 11 pm. St. John Neumann and Blessed Francis X. Seelos, C.Ss.R. have both served as Pastor of this historic Lithuanian parish. One of the only non-parish shrine churches in honor of St. Jude in the country. Founded in 1791, St. Mary’s was the first Seminary in the United States. The Chapel shares much in common with the Basilica. 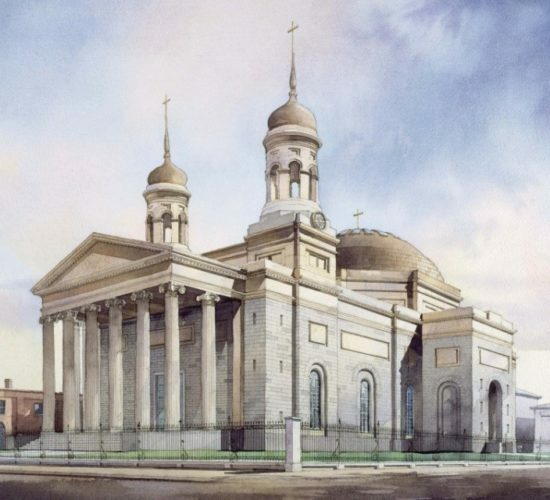 Construction also began in 1806; it was consecrated by Archbishop John Carroll; and the Chapel’s architect, Maximilian Godefoy, consulted the Basilica’s architect, Benjamin Henry Latrobe, on its design. St. Mary’s Chapel is also a National Historic Landmark. With the help of her friend, John Carroll, Elizabeth Ann Seton established a school for girls at St. Mary’s Seminary. While living at this house from 1808 to 1809, she took her religious vows at St. Mary’s Seminary Chapel and founded the religious order of the Daughters of Charity. Afterwards, she established a school for girls in Emmitsburg, Maryland, the first parochial school in America. Originally built in 1856 to serve the students and families of Loyola College, the recently renovated Saint Ignatius Church provides regular liturgical and sacramental celebrations for its people. The first African-American Catholic community in the United States. Cathedral of Baltimore. Constructed from 1954-1959. Dedicated in 1841, St. Vincent’s is the oldest Catholic parish church in continuous use in Baltimore. Located in the heart of Baltimore’s Little Italy, this historically Italian parish opened in 1881. At Baltimore’s premier Polish-American Catholic church, Holy Rosary, the Divine Mercy Shrine is dedicated to Trusting in Jesus’ Love through the power of His Healing Mercy. Pilgrimages and tours of the Shrine and Church are available by appointment only. 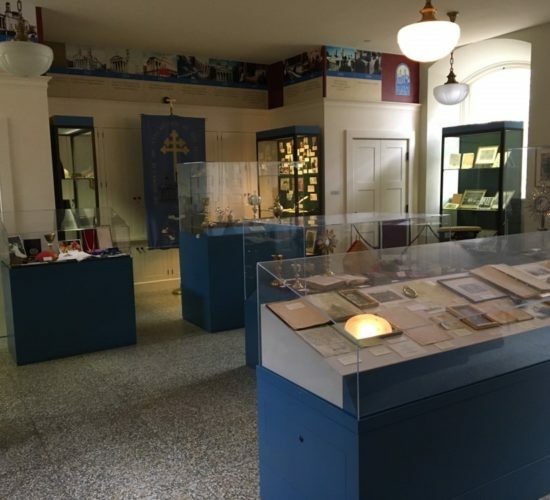 Located approximately one half hour from the Basilica, in historic Ellicott City, at the home of the Franciscan Friars, the Shrine houses a major relic of St. Anthony in its Chapel, which is open to the public.